To change the attitude, a person needs to write it, speak it and act on it. Everyone learns differently, of course, but without action, gratitude is just one of those things that means very little. 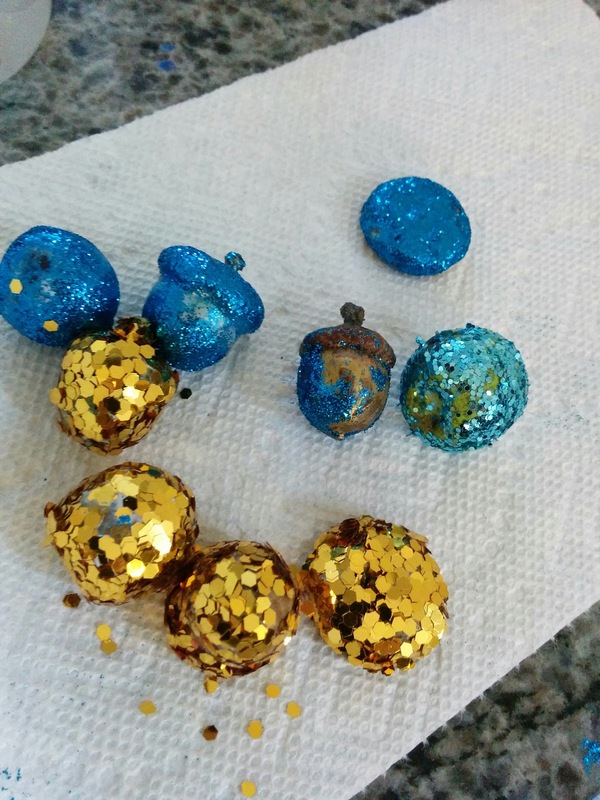 This isn't a glitter bomb, of course. 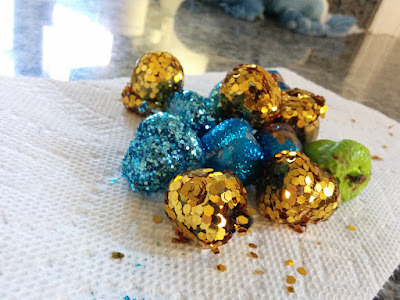 This is a photo of a glitter craft I did with a 4 year old and an almost 2 year old yesterday. So- kinda a glitter bomb. And pretty. Gratitude and Generosity go hand in hand, because gratitude is more than just an act of thankfulness. Gratitude is an acknowledgement of what you have. Giving is the action of that acknowledgement - the action response to understanding that YOU have something of value to give. Being a craft lover hoarder ( I need a support group) there are times when all I am aware of are the things I don't have (a full set of Caran D'ache Neocolor ii's) and forget the things I do have (a lovely set of 80 Intense blocks.) I focus way to much on the fact that it is really expensive to take the family out to dinner, and I forget that we always have food to eat. I forget that I am taken care of, provided for, and have all the ingredients for basic comfort. I forget that I have enough that I can even share. Sharing does not come naturally. Actually with children, sharing is a skill that comes with brain development...but if you miss that window to teach the skill or something impacts that crucial development, that child will spend the rest of her life struggling to learn that skill. Sharing and giving are things that must be practiced with action, which brings me back to Gratitude and Generosity. Which is why, one of the important parts of this Heart Of Gratitude Journey is giving stuff away. Only - I've been working so much (I am so grateful for work!) that I don't have pictures of my Giveaway. 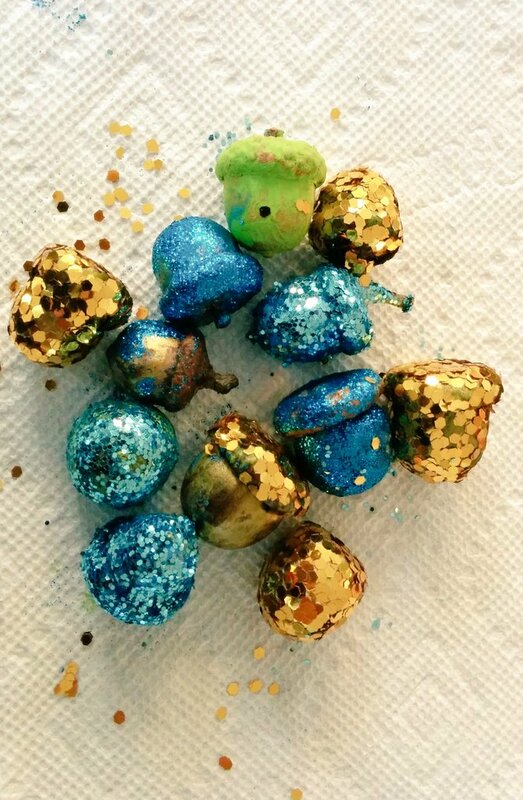 I do have pretty pictures of glittered acorns. Today in the Gratitude Girls Cheer League, we are going to practice Giving Stuff away. All DAY LONG. We have several special guest giveaways that I am so excited to be sharing with you. We hope you join-in, enter all the giveaways, share your stories, and be blessed by the day. I pray this weekend helps heal your heart and lets you know you are special and you are loved. You are a blessing! I'm excited to share a photo of an upcoming give-a-way today too! Oh, and my kids and I plan to create our own set of glitter acorns over Thanksgiving break!